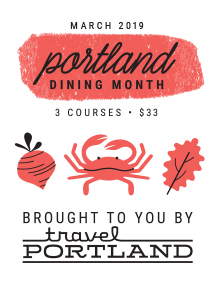 March is Portland Dining Month! This is one of my favorite times of the year, almost better than Christmas. There are 137 restaurants this year, each offering 3-course menus for $33. I generally try to make about 3 different reservations for the month to make sure I get to try the places I’m most interested in experiencing. The Travel Portland website is where you’ll find all of the restaurants listed as well as make reservations for most locations. And if you book trough Open Table on the Travel Portland website, you’ll be supporting the Oregon Food Bank. Everyone wins! Another great event that benefits charity is the Deconstruction educational evening hosted at Two Stroke Coffee House on March 17th. This event benefits the California Wildfire Relief Fund. The theme is Japanese food and culture, so there will be a wet stone knife sharpening demonstration by Yonhei Salo, a Japanese tea ceremony by Life Sampling PDX, and food prepared by Megan Denton of Able Farms on Sauvie Island. And of course, there will be sake from our local saké distiller SakéOne from Forest Grove.